The 'global data'-feature is a great way to manage the most basic parts of your content across all your pages and channels. With global data, you only need to enter the basic information once, e.g. phone number, address, business name or email address. The information will then be automatically fed into all the relevant modules on your site. This feature makes it easy to update your site - for example if your company moves to another location. 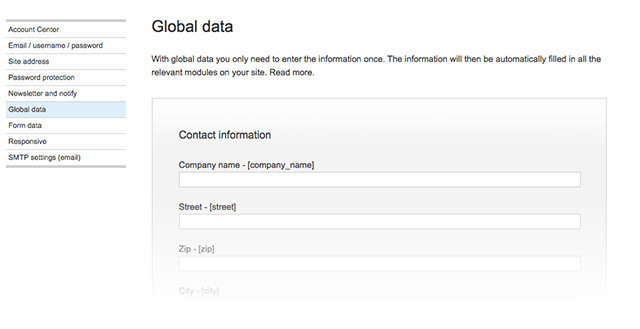 Simply fill in the new address on the global data page and the information will be updated all over - with one click! Some modules are by default set to sync with the data you have entered in your global data settings. But you can also call upon your global data elsewhere on your site by typing the global data 'tags'. Global data is especially helpful when you create templates. By placing specific global data tags into relevant modules on the template, you automatically ensure, that data will be applied everywhere you want it to when you create sites from your templates. Read more about how to use global data under the manuals section.